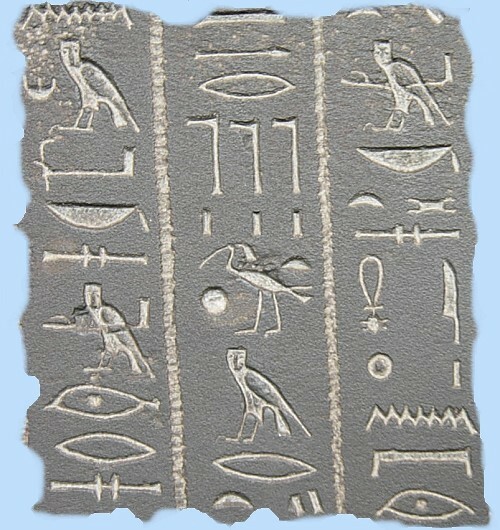 Egyptians were among the very first people to invent writing such as ink and paper. A Pharaoh(king) would never let his hair be seen , he would always wear a crown or a hair headdress. It would probably took between 20,000 to 30,000 workers over 80 years to build the pyramids of Giza! Egyptians worshiped over 1,400 different gods and goddesses. The Egyptian pyramid workers were paid with beer:1gallon(4liters) per day. Cleopatra, the last pharaoh of Egypt, was actually Greek , not Egyptian! The lost Egyptian city of Herracleion was found after 1200 years under the sea the first sailing boats were invented in Egypt. A king ,named Tutankhamun, died at the age of 18. Today in humanities we were learning about Ancient Egyptian’s writing which is called hieroglyphs. Hieroglyphs comes for two Greek words hieros means holy and glyphe means writing altogether it is holy writing. We learned how to write our name in hieroglyphs. Strangely, they used to write some words from top to bottom instead right to left. We had to write our name from top to bottom. The didn’t used words they used pictures. After that we learned how to make papyrus paper which is made from a plant. We got some pictures and we had to put them in order of which they start from. We also had to tell what was happening in the pictures. The first step that we did was to get a sheet of tin foil and make the body out of it, the next step was to get lots of sheets of kitchen roll and rip the kitchen roll up into pieces. Then we wet the pieces and rapped it round the tin foil body. Once we had done that and let it dry we covered the whole body in glue. At the moment we are making our sarcophagus which is very simple and fun to make. On Fridays we do art and at the minute we are making mummy’s and their tombs. Last week we made our tombs by getting card and cutting out the shape of a tomb then we got a strip of card and cut 1cm lines in it then bended it around out tomb cut outs. The week before that we made tin foil mummy’s then got tissue paper wet it and wrapped it around the tin foil. Have you ever wondered how found the youngest Pharaoh’s tomb? Well, now you will find out. Lets take a journey into the past, about 3,000 years back when the Pharaoh Tutankhamun was crowned at the age of 7! He was made King at the age of 7 and was told that he had to chose a bride. The girl he chose was his sister! Sadly, King Tut died at the age of 18 and was buried in the Land of the Kings. Howard Carter,who was a painter at the time, wanted to become an archaeologist and wanted to find lots of Kings tombs. The Kings tomb that he really wanted to find was Tutankhamun’s tomb. He wanted to find it so bad that he spent loads of money and kept searching for 20 years! Imagine digging for 20 years and not finding anything. However his luck was about to change. One day a waterboy was taking his break when he discovered a step leading into the ground. He told Howard and suddenly he found 15 other steps. He had soon uncovered all of the steps and broken into a very special room called the antechamber where all of the things the king would need for the after life were kept. Then he found a sealed door leading to the kings burial chamber. He had soon found the kings mummy, all of his treasure and his golden mask. Here is a website about Howard Carter. Egyptians were very civilised people and they worked in ranks. At the top was the Pharaoh who was king of all and at the bottom was the farmers. Egyptian towns would build their community around a river which was called the River Nile. This river would flood every year and create a black mud which is what the farmers would use to plant their crops in. These people would write in hieroglyphics instead of English like you and me. Each symbol would mean a different letter or sound, so it must of been really hard to remember them all. When a Pharaoh got married both of the people would promise each other that they would be killed when one of them died which was really unfortunate of king Tutankhamun’s bride because he died at the age of 18! I hope some of the facts I have written were ones you didn’t know before.